On a family holiday in northern KwaZulu-Natal, you'll find there is an amazing range of things to do and see. You can set off on a different excursion every other day and still have loads to experience. Here are some suggestions to get you going... Families based on the Elephant Coast will find many attractions within a driving radius of the town of Hluhluwe. This region is known as a bush and beach destination because you can combine Big Five game viewing with wonderful coastal activities in the same day. It is also includes Zululand and its many cultural attractions. This national park is a World Heritage Site and if you are anywhere on the coast then you are in iSimangaliso. This park brings together many elements which can be explored such as pristine beaches and the highest vegetated sand dunes in the world plus great wildlife viewing. Top activities include water sports, cruising, canoeing, mountain biking, quad biking and horse riding. Visit a traditional village and discover the Zulu culture, history and colourful customs. You could visit the Witchdoctor (traditional healer and intuitive), buy beautiful arts and crafts and stay for a fabulous meal and dance display. 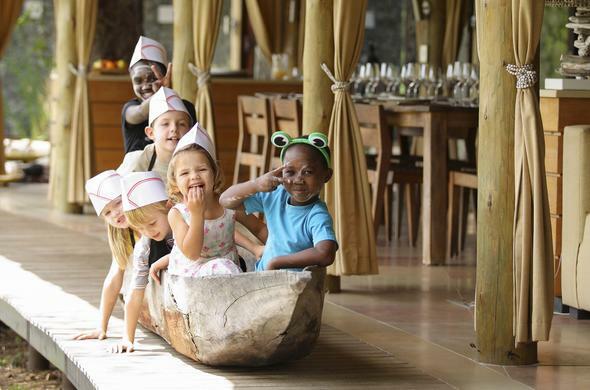 Dumazulu offers a comprehensive Zulu experience with traditional meals, shows and interaction plus a Croc and Snake Park. Enjoy a personal tour of the facility and learn about endangered Wild Cat species in South Africa. You will be able to get close to the beautiful Caracal or Lynx, Serval, Cheetah and African Wildcat. There are morning and afternoon tours (feeding occurs on the later session) plus informative talks by a centre guide. For safety, there is a height restriction of 1.2 metres for children (about 3 feet 11 inches). The lodge has a great restaurant if you want to book ahead for a meal. Take a walk on the wild side! It is advisable to have cash on hand for park entries and to pay for activities. Malaria precautions are necessary. Hluhluhwe / iMfolozi Park offers Big Five Game viewing, self-drive routes, picnic spots, view sites and there is a nice terrace and restaurant at Hilltop Camp. Mkuze Game Reserve is wonderful for birding and offers driving routes, guided walks, picnic sites, a swimming pool and restaurant.For the adventurous family in a 4x4 there is Ndumo Game Reserve which has an exceptional bird count including water birds and offers drive routes plus guided day walks. There is also Tembe Elephant Park, although entrance is limited so you should take an official tour or call ahead and enquire about day visitor entry. This fun activity is something families can happily do together. Top spots for snorkelling are Cape Vidal, Sodwana Bay (one of the best in the world), Rocktail Bay and Kosi Bay (for remote but beautiful reefs). For a great day out Ilala offers a fun and relaxing place for the whole family. See the largest collection of Zulu baskets in the world and visit the workshop, you can purchase collectibles to celebrate any occasion and even pick up great Christmas decorations. You can relax in the restaurant or in the garden with a drink while the kids explore the play area.